Google is making its own list this holiday season—or, more specifically, it's letting users do so. On Tuesday, the company was set to announce the addition of Shortlists to Google Shopping. The tool lets users bookmark and compare products featured on Google Shopping and other sites and share a Shortlist with others who can add products or leave notes on existing products (e.g. “I’m not sure John meant it when he said he wants a new Furby for Christmas” or “Jane already has that sweater, but this scarf would go well with it”). A Google spokesperson said the company would not use Shortlist data for ad targeting or share with brands Shortlist metrics, such as the number of users who included a product in a Shortlist or other items featured alongside a brand’s product in a Shortlist. Shortlist isn’t the only change that Google is making to Shopping. In addition to being able to view retailers’ catalogs, 360-degree product images, product reviews and products that look like a viewed item (described as “visually similar” results), users will also be able to see any offers or promotions tied to a product. Retailers will be able to submit their own offers and promotions to Google through its Merchant Center, where they can create exclusive deals or promote existing online offers. 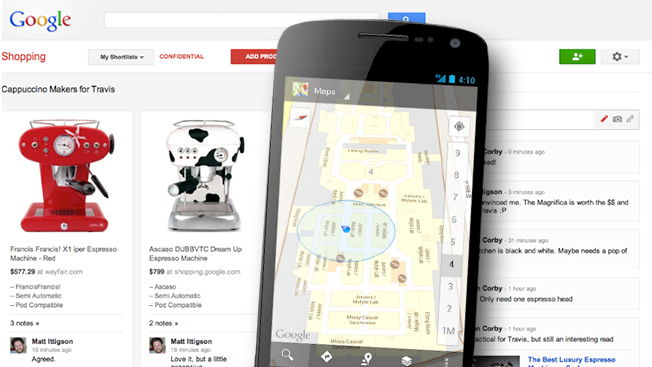 Users of Google Maps for Android will be able to discover deals or promotions when near a relevant store. That’s not all Android Maps users will be able to view this holiday season. Google has plotted indoor maps of 10,000 locations worldwide, including U.S. store locations for Macy’s, Best Buy, Home Depot and Toys R Us. Through indoor maps, a user could zoom into a Macy’s store to see where the jewelry or shoes sections are or just find the bathrooms. One could easily imagine how Google might develop indoor maps to include sponsored listings, as it does for its regular Android Maps app, or layer in product inventory data to retailer’s floor plans, but that won’t be the case. “Brands will not be able to run sponsored listings within Indoor Maps, and there are no current plans to provide product inventory data within Indoor Maps. It's more about helping shoppers figure out where they are, what's around, and getting directions indoors where possible,” the Google rep said.